You’ll want to cozy up with this winter take on a classic summer pasta dish. The basil in the pesto is a background note, there to play a supporting role to the main star: Lacinato kale. It adds a great nutritional boost to the pesto, along with almonds in lieu of the traditional pine nut. Sun-dried tomatoes and crispy Brussels sprouts round things out for a meal that’s delightfully earthy and hugely satisfying. Salt a large pot of water and put it on to boil. Preheat your oven to 450 °F. Rinse and dry the Brussel sprouts, trim the ends, and peel off as many of the leaves as you can. Reserve the inner cores of the sprouts. On a baking sheet, toss the leaves with 1 tbsp olive oil and a pinch of salt and pepper. Put in oven and bake until crispy and brown in spots, about 6 to 7 minutes. Add the cavatelli to the boiling water. Stir occasionally, and start tasting the pasta after 8 minutes. Cook until al dente, and reserve 1/2 cup of the cooking water. Drain the pasta in a colander. Toss the pasta with a ½ tsp of olive oil to prevent sticking, and return to the pot, off of the heat. Rinse the lemon. Rinse and dry the basil. Rinse the kale leaves, remove the stems, and discard stems. Add basil, kale, garlic, almonds, 2 tbsp olive oil, chili flakes (use more or less depending on your affinity for heat), the reserved pasta water, and the juice from half the lemon to the bowl of a food processor. Blend until smooth, and season to taste with salt and pepper. Slice the sun-dried tomatoes thinly lengthwise. Be careful, as the oil they’re packed in can make the tomatoes a little bit slippery! Set aside. Add the kale pesto to the cavatelli pasta in the pot, along with ¾ of the crispy Brussels sprout leaves. Season to taste with salt and pepper, and toss well. 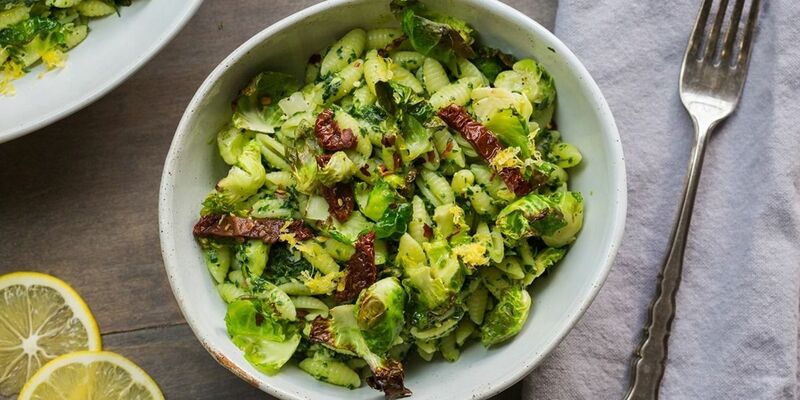 Serve the kale pesto pasta in large bowls, and top with the sun-dried tomatoes and the remaining Brussels sprout leaves. Enjoy!